Guiding a church through denominational change is daunting. Yet after realizing their church’s biblical beliefs and denominational stances didn’t match, First Presbyterian Church in Douglasville, Georgia, knew it was a step they had to take. Not only were they faced with keeping the 55-year-old congregation of 650 people united, they were also met with a challenging process for leaving including raising nearly a half million dollars to keep their building. The old denomination’s process called for 80% of the congregation to vote for the change. Yet, FPCD leadership couldn’t imagine losing 20% of people they cared about, so they set the goal of getting 95% agreement. While there were many tactical pieces that needed work, FPCD first spent time creating foundational strategy. The denominational separation process was going to be long, with lots of moving pieces. FPCD decided to develop multiple communications teams to handle various stages of the process so that people had a manageable workload. Also, understanding that different members process messages in different ways, FPCD used a variety of means to communicate with members. Another important piece of the campaign was in-person and printed testimonies. Hearing from fellow members, instead of only church leaders, made others more comfortable with the process. Finally, FPCD had a “Shepherding Team” who made an effort to reach out to each member in person during the process to make sure even those on the fringe felt like they were involved. In the end, 95.5% of the congregation voted for the change. When it comes to major changes like denominational affiliation, it can often lead to church splits or even closure. FPCD leaned in to their belief God was calling for them to change and built a process that was thorough, intentional, personal, inclusive and cohesive. 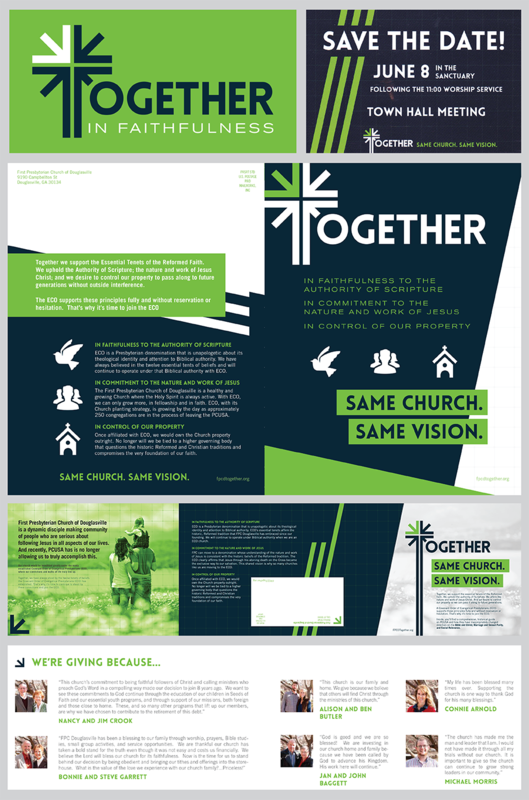 Not only did the campaign develop unity, but it’s also making the church more noticeable in their community. New people are coming -- helping FPCD thrive and not just survive. In February, FPCD will host “Night to Shine” -- a prom night experience, centered on God’s love, for people with special needs 16 and older. It will be a true red carpet experience with limos, photos, catered food, a DJ, decorations and more. Lol. They changed presbyterian groups, not denominations. The congregation was dismissed from the Presbyterian Church (U.S.A.) and it joined a, then, new denomination called ECO: A Covenant Order of Evangelical Presbyterians. If is not like the went Lutheran, Baptist, Assembly of God or Church of Christ.